These are a magical items that the Queen of Darkness gifts her favourites with. 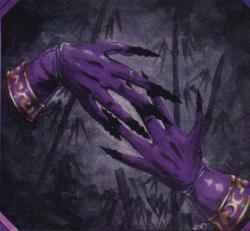 They appear to be purple silk gloves streaked with shifting darkness, the end of each finger is tipped with a razor sharp shadow blade very similar to the Blade of Darkness Fu Power. Claws of Darkness do Strength +3 damage and also add +5 to the Intimidation skill of whoever is wearing them. In addition they will absorb the Chi of anyone that they kill, leaving a dry mummified corpse. It is thought that most of this Chi is channelled to Ming I, The Queen of Darkness herself, however the Claws can choose to boon their wearer a portion of the stolen Chi (about 1 point, that can be used however the individual sees fit, but once spent is gone forever) however this stolen Chi has a warping effect on the user and each point counts as a mutation point that is rolled just the same as Arcanowave mutation at the end of the session, although the mutation from the Claws of Darkness is resisted with the Shaping Skill. Finally, if the wearer of the Claws of Darkness is ever slain whilst wearing them, he can choose to possess the Claws with his spirit. The Claws will then hunt down and rip the killer apart. Unique Schtick: Volley of Darkness/the Claw can fire a Blade of Darkness out of every digit, each blade must target a different target and Chi must spent for each one. Only one combat roll is made and applied to all opponents. Notes: Think Evil Dead II. Remember that Two Claws will attempt to hunt down the Characters, and the stats above are only applicable to one of the Claws. These can be a pretty tough opponent.